A Great Tan Without the Bed! 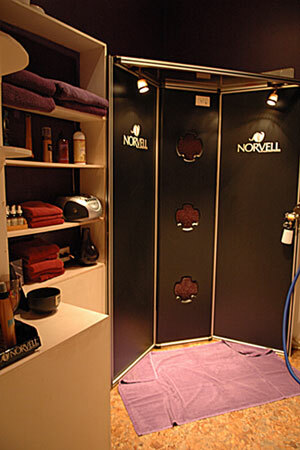 Saule Tanning offers one the most natural looking sunless spray tanning available, the Norvell Airbrush Amber Sun System! Get that "just off the beach" color with a fast-drying, streak-free application without that unnatural orange color you see with other sunless tanning systems. A fast drying, golden brown spray-on color solution, the Norvell Amber Sun System gives you color in two ways. The first is with a COSMETIC BRONZER (instant) that is visible the moment you apply the product. Next, a DHA BRONZER (dihydroxyacetone) reacts with the amino acids in your skin to develop color over 2-3 hours with no orange color. Norvell’s even, streak-free formula has built-in sheeting action to eliminate spotting and streaking. It also contains Erythrulose, an additional bronzer that extends the life of your tan. The micro-emulsion technology provides an even, effective mist application while a proprietary odor inhibitor eliminates unpleasant odor usually associated with sunless products. Amber Sun is a Aloe Vera based product that naturally good for your skin. It utilizes skin firming Copper “Firm-a-derm” technology for younger, youthful looking skin and Caffeine which is proven to protect your skin from detrimental effects of over exposure to the sun. Caffeine has also been proven to reduce cellulite. Ready to try the quickest, most natural looking sunless tan on the market? Please read this information before your first session with us to get the most of your sunless tan and maintain and even enhance the results! You can also call us at 910.794.9104 or email us with any questions or to schedule an appointment.